All the fun of confetti without any (or at least most) of the mess. 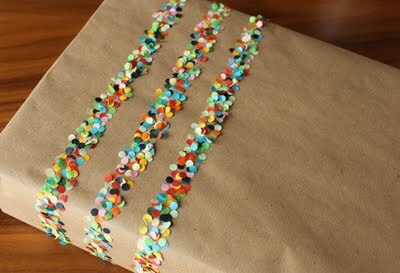 3@12 used double sided tape and confetti to dress up simple kraft wrapping paper. It would be a fun way to dress up a birthday invitation too. And who wouldn't want confetti stripes as part of their party decor, especially without having to vacuum up a pound of confetti when the party is over. You can check out this fun confetti idea HERE.